RVers can sometimes be a stubborn group when it comes to embracing technology. Many people started out with a road map and destination and don’t want anything else getting in the way of the experience. Times are changing and many people who were hesitant about embracing technology such as GPS or camping apps on their phone are now into the resources that these advancements provide. There are several RVing and camping specific apps that have made their way into the world of RVing and one of the first web apps hoping to be a go-to resource for campers and RVers alike. It is called Campendium and its set to take on the camping world. 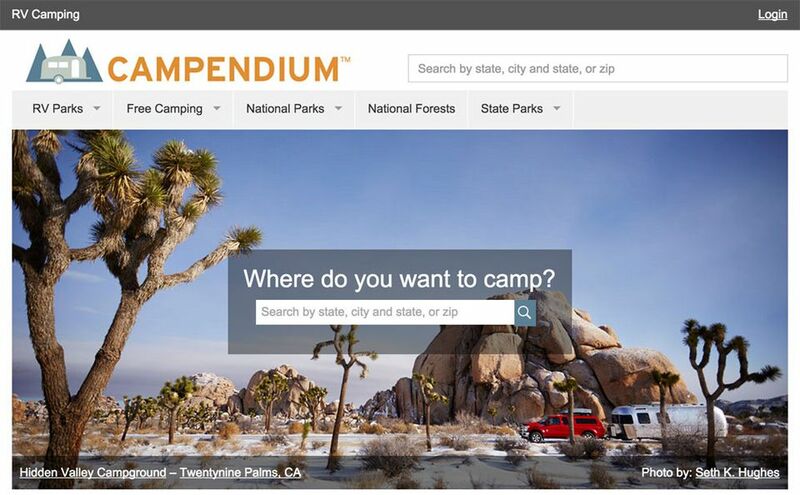 Let’s look at this app, what it does, and what the creators hope to provide for the r.
Campendium is a web app that seeks to help users search, review, preview and even take a virtual visit to over 21,000 different campgrounds throughout the lower 48 states and Alaska. It's available for iOS devices and on the web. With the camping industry in the United States bringing in over a billion dollars annually and 20 million RVers hitting the roads, ​Campendium co-founder, and President Brian Easterling decided it was time to start bringing this demographic into the digital age. "By finally modernizing campground research, we're helping people change their camping experience for the better. Our 900+ beta users have already reviewed more than 600 campsites, added 463 blog posts and over 1,500 photos. We're excited to open Campendium to the public and further expand our services to the community." Campendium wants to unite the RVing web, which is scattered among outdated websites, information, and destination guides. They want to create a central place for RVers and campers to find the information they need to get the most out of the open road. Whether you’re a RVer or a camper, Campendium.com offers something for every adventurer looking to hit the road and leave everyday life behind. The idea of Campendium was thought up by a group of young full-time Airstreamers. They wanted to bring together all the information scattered throughout the web from blogs to forums and upload them into one central resource. The app will also allow users to edit reviews and post their own photos, making sure everyone has a hand in achieving Campendium’s vision. Campendium is a tremendous resource for RVers and campers alike. Right now, there’s no one place on the web to get information on RV parks and campgrounds in one place. Until now. Campendium wants to change the way RVers, and campers, find places to stay throughout the country. By creating one place you can get all the information you’d ever need in an RV park or campground, RVers can get just that and more. So get out of your camping cave and get into the digital age by utilizing a great app like Campendium. If you’re looking for more information to make a choice about where to park on your next RV trip, check out what Campendium has to offer. As more services begin to make RVer’s lives easier, it’s only a matter of time before you find the right place to book an RV site, find a place to go, and make RVing easier in general. Campendium is the first of many who will change the way RVing works in a digital world. For more information, such as updates, information and how to get on board visit their website at Campendium.com.